Nicely wooded corner lot in popular Bear Creek Lakes, minutes to new EZ Pass ramp of the PA Turnpike bringing Allentown and Wilkes-Barre to within 20 minutes, suburban Phila with 45 mins and NYC 2 hours. 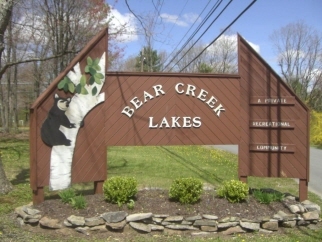 Community with lake, pool, tennis courts, beaches, boat ramp. Low dues include security, road maintenance and all amenities. Close to all the Poconos has to offer - ski, snow activities, hunt, fish, hike, bike, swim, shop, antiquing, you name it.